Vicarage Road is far from being the most attractive away ground, but for me it represents a rare chance to see the Addicks without spending at least two hours on the road. In fairness it could actually be quite a pleasant modern stadium (not dissimilar from The Valley infact), if only they'd construct a perfunctory stand to replace the supporter-less eyesore which covers one entire flank. Then again if they had more seats to fill the club might have to reduce the rather ludicrous prices (£26-£31 for adults), which puts our own much more favourable pricing scheme in perspective. Nonetheless as I tend to do these days, I opted to sit amongst the home fans given a primeval dislike of the behind-the-goal view. Chris Powell is at heart a highly conservative manager and his team selection reflected it - this is not a criticism incidentally, but merely an obvious observation. It's clear that his favoured players are not necessarily the 'best' players, but those that he trusts to obey instructions and to 'do a job'. Bradley Pritchard, Lawrie Wilson, and Johnnie Jackson for example will never win any footballing talent contests, but it's clear that he trusts them unquestionably. He may have been surprised however by Gianfranco Zola's team selection, the mercurial Fernando Forestieri and Alex Geijo preferred to Matej Vydra and Troy Deeney, despite an impressive win at Brighton on Saturday. Having played under the original Tinkerman (Claudio Ranieri), it seems he can't help tinkering himself - surely he couldn't have prioritised the FA Cup tie at Man City over a far more important Championship game? Either way, although Vydra and Deeney would enter the fray before the end, it smacked of 'Football Manager' style decision-making, ironic given the club's shirt sponsors. Watford took the lead early on however seemingly justifying their manager's selection, a weak shot was strangely only parried by Ben Hamer into the path of Daniel Pudil who fired home. Despite the soft goal, Charlton were firmly in the match and were dominating midfield (not a common occurrence in truth), the energy of Pritchard especially noteworthy, as well as neat interplay along the right flank between Wilson and the dependable Chris Solly. Seemingly shell-shocked, Watford were soon behind when a rampaging Cedric Evina fed Bradley Pritchard and his delicate chipped cross was nodded in by Yann Kermogant. An early second-half onslaught was understandable and indeed it was almost entirely one-way traffic between the interval and Geijo's delightful goal which seemed to put the game beyond the subdued Addicks. One can inherently dislike Watford's use of the loan system and specifically its tie-ups with Granada and Udinese (as well as wondering how much freedom Zola really has in team selection), but for this brief period the technical quality on show was highly impressive and unmistakenly 'continental'. Forestieri was involved in all of their best moves, and whilst he had not exactly won the hearts of the travelling fans with his first-half handball, he is a fabulous talent. At 3-2 and with Ben Hamer having already intervened impressively twice, one feared a 5-2 or 6-2 hammering but a stroke of luck totally changed the momentum of the game, and Charlton's far greater team spirit ensured there would then only be one winner. Some great work by the ever-impressive Fuller set up the pinball which led ultimately to the goal, and the degree to which Watford heads dropped was tangible. That's the problem with loan players as we know only too well - they're not so great when things aren't going their way. Most Charlton fans would probably have taken a point at this stage but Jackson's bullet header from a corner he might ordinarily have taken was the icing on the cake. There was still the best part of 20 minutes left (including injury time) but other than a tight offside decision against Vydra, Hamer's goal was rarely troubled again. 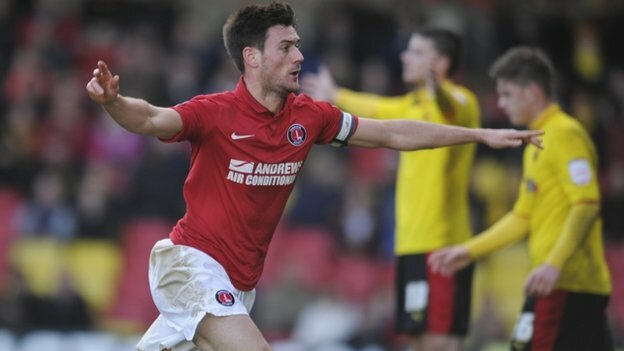 A massive win without doubt which leaves Charlton almost equidistant between play-off and relegation places. Our home form hasn't turned as I hoped it would, so a season of midtable consolidation would represent a successful outcome from here. However just as the much-needed Cardiff win proved the catalyst to a nice run of results, perhaps this similarly crazy result will do the same. Fuller 8 - led the line brilliantly; his first touch can be sublime and his unpredictability riles defenders. A positive report NYA!! It must have been good! A very big win after the twin disappointments against Ipswich and Derby.